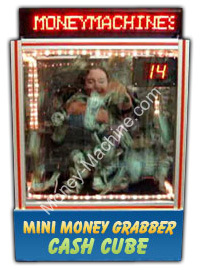 PromotionStore.com assists its clients in attracting large crowds by using a money machine. 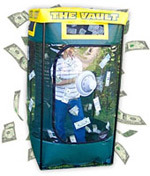 A cash cube money machine has a see-through case on three sides, which makes it easy for bystanders to watch what is happening in the booth, while a mechanism propels money or prize vouchers into the air at great speeds challenging participants to capture as many items as they can during the allotted time frame. Helping clients achieve their marketing potential has a great deal to do with attracting large groups and a money blowing machine appears to do just that. 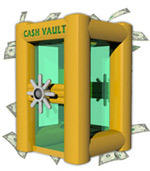 The reason for this, lies in the cash cube money machine's ability to tap into human curiosity and the human challenge factor. Why do people climb mountains? The answer is because it is a challenge. So, why would some people agree to become spectacles for others to watch? The reply is because they have seen how difficult it is to gain prizes from a money machine yet they believe they can do better than the previous participant did. They have been challenged to do what someone else cannot do. Why do people stop to look at a small accident? The answer is because they are curious to see what is going on in the world around them. It only takes a few curious onlookers to stop and look at an anomaly before more people are drawn to what the first curious few originally stopped to ponder. 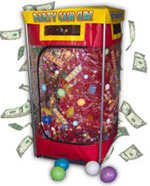 A money blowing booth is a curiosity within the marketing community, because not only does it offer something of value to the participants, such as money, raffle tickets, or prizes; but it also challenges them unlike any other promotional item. 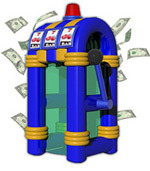 For instance, a prize wheel is simply a game of chance because no one knows where the arrow will stop; the cash cube, on the other hand, involves chance while giving the participant the ability to gain something by using their own abilities. 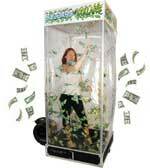 Financial institutions, such as Investors Savings Bank of Morristown, New Jersey, have utilized a money blowing booth to promote grand opening celebrations. 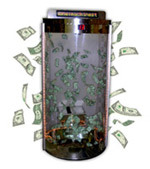 Attendees who were over the age of 18 were given 15 seconds inside a money blowing machine that featured $1, $5, $20, and occasional $100 bills. Their turn out was quite notable. Another financial institution also included a cash cube in its grand opening celebration. 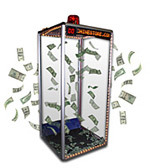 The Credit Union Association of New York enhanced their turnout by adding a money machine to its other entertainment ideas. 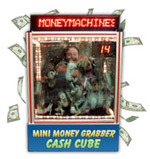 Another great idea for using a cash cube money machine includes celebrating a business. 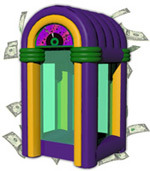 For instance, Southwest Airlines provided a money machine at the New Orleans Louie Armstrong International Airport location to celebrate 30 years of service to the Big Easy. These are just a few of the many ideas organizations have come up with to include a money blowing cube in their marketing plans. Private corporations, academic institutions, and non-profit organizations use them to develop challenging, fun promotions that have the ability to generate public awareness, which is what marketing is all about.